When you're looking to buy something as expensive and mysterious as a diamond, you should know as much as possible about them. There are many ways of learning about diamonds. Our About Diamond page is a good start. You can also find information on other websites and in books. However, this doesn't help you much in physically grading a diamond or going through the diamond buying process, but it does help to know what's important to you about diamonds before your go shopping. 1. Learn as much as you can about diamonds. Knowing the terms used in diamond grading will help you understand what the salesperson is saying. 2. Rearrange the 4C’s to your preferences. Carat, Color, Clarity, Cut. 3. Physically visit a jewelry store. Find a jeweler willing to spend some time with you to examine diamonds. 4. Ask if the diamond has a certificate. There are several independent laboratories out there that grade gems. The most popular one is GIA (Gemological Institute of America). GIA set the standards by which all others follow. Other labs used by us are EGL (European Gemological Laboratory) and AGS (American Gem Society). Be aware that different labs may produce different results and that not all of our gems come with a certificate. Note also the difference between an appraisal and certificate. An appraisal is just a report on a diamond written by a gemologist while a certificate is a report issued by a lab. 5. Just like automobiles have the Kelley Blue Book, diamonds have the Rapaport Diamond Report (Rap Sheet). This lists the high wholesale prices for diamonds in the NY market. 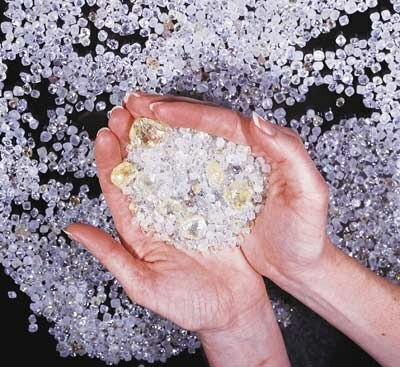 The price stated on the Rap Sheet is only a starting point for pricing diamonds. Many other factors alter the price such as its cut and fluorescence. Even market fluctuations can affect the prices such as supply and demand. 6. Don’t pay a premium for one of the C’s and get a lower quality in another C.
7. Is it safe to buy a diamond online? Sure! Online, you can watch the other customers and get a pretty good idea of what to expect. You can also review the feedback section of their website to read comments left by previous customers.